Immature millet grains – why remove when processing? The primary motivation to eat cereal grains such as paddy rice, millet rices, or wheat is the nutrition we can derive from these. 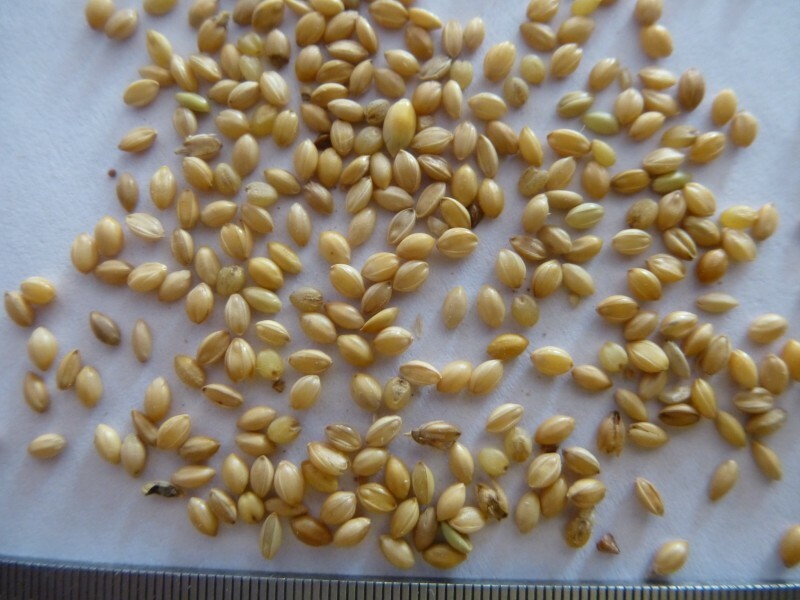 The largest component, in terms of weight composition of the grain are the carbohydrates in each of these grains. The other nutritional components we can derive from these grains are fibre, minerals and essential fatty acids – to varying degrees depending on the nutritional content of individual grains. In a recent post, I had mentioned about how we can use the carbohydrate to fibre ratio as a fairly good indicator to identify a grain that suits one’s dietary needs. Note the immature grains in this foxtail millet sample. They are the thin ones distributed throughout, some with a greenish color. When a grain is very light, it is not filled with enough carbohydrates in its endosperm – the hard part of the grain. These grains typically do not get dehusked properly during the hulling process. And even when they do, the millet rice kernel tend to shatter resulting in an increase in the grits among the millet rice kernels. These immature grains would also not taste good when eaten primarily due to the ill-formed starch component in the endosperm or the heart of the grain. So the cooking quality deteriorates dramatically even if we are able to process them to rice or rawa form. one is able to get the husk off without damaging the millet rice kernel. And once the oil on a few grains go rancid, it gives the entire package a foul odour and the rancidity spreads to the other mature grains too. To summarize, removing the immature millet grains from the better formed ones during processing for the millet rice, improves (i) the taste (ii) the cooking quality (iii) shelf life and (iv) the cleanliness of the product. Once separated, the light grains can be used for cattle feed as it is rich in cellulosic material. Posted on September 27, 2016 by DwijiPosted in Agriculture, Food, millet processing, MilletsTagged agriculture, millets, processing. Previous Previous post: How does eating millets help those with diabetes? I think there is a typo in this sentence: “These grains typically do get dehusked properly during the hulling process.” . should it not be “do not get de-husked”. Just curious to know how they were dehusked earlier before the processing machines? Was it ever de-husked in small quantities in homes like the dry dal grinders and the home-based flour mills? Thank you Sindhu ! Yes, that was a typo !! Corrected it. Before processing machines people either pounded them or ground them, using appropriate tools designed for that purpose. Even today, we can find many families, mostly in adivasi families, storing the grains and dehusking for the day’s consumption. I do not know of any machines that were/are used for processing at a household level.